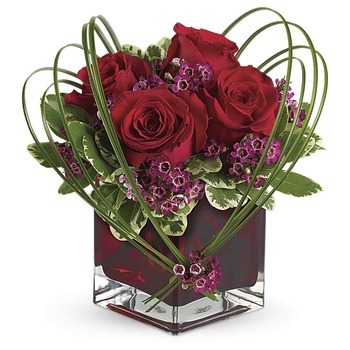 A graceful heart of bear grass… tied with purple waxflower blossoms… forms a heart that appears to float above the velvety red roses in this delightful Valentine’s Day bouquet, arranged in a ruby-red cube vase. Send this beautiful floral arrangement to someone you love, and they’ll think sweet thoughts about you! * 1st In Flowers are an outstanding company which provides a first class service and products at a very reasonable price.